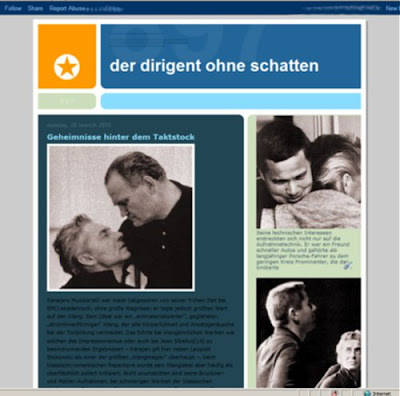 'Secrets behind the baton' (Geheimnisse hinter dem Taktstock) is the headline on this German website claiming to feature 'sensational' photos of conductor Herbert von Karajan. A German reader reports that http://www.derleiterohneeinenschateen.de/ (The conductor without a shadow) appeared online earlier this week to coincide with the start of the Salzburg Easter Festival but was removed after less than twenty-four hours following threats of legal action. It appears the candid photos were intended for a documentary on Karajan that was abandoned during the early stages of production in the 1980s. The material came to light recently when the archives of an insolvent Berlin based video company were being cleared. Reports in the German press suggest that further legal action is being pursued in London, which has some of the strictest privacy laws in the world. Thanks go to reader Gerd Heidemann for the heads up on this story and the featured screengrab. The secrets of Karajan's personal photographer are uncovered here. Judging by my traffic counter a lot of readers enjoyed this little April Fools post. Main photo – Karajan playing Sieglinde to Jon Vickers’ Siegmund at Salzburg Easter Festival, 1967. Top right – Karajan thanks Dietrich Fischer-Dieskau following the completion of the recording of Haydn’s The Creation, 1968. Lower right – Karajan discussing the next shot with Ernst Wild during filming of Bizet’s Carmen.